A terrible pun is now a silly shirt! With newly revised and improved art for 2016! 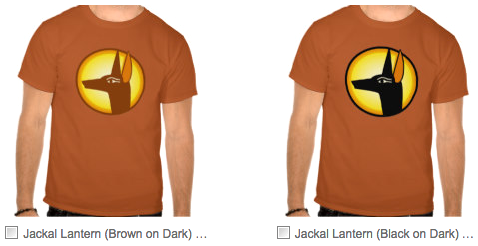 Author Staff WriterPosted on September 1, 2016 September 1, 2016 Categories Design, Physical Object, WeaponsTags Advertisement, Anubis, Halloween, Humor, Jack-O-Lantern, Jackal, Shirt, Silliness, TeePublicLeave a comment on Jackal Lantern Shirts! Based loosely on an old pun, which I know I am not the first to come up with. These show the ancient Egyptian jackal-headed god of the underworld, Anubis. Rather appropriate, I think. Use the code ZAZZLETREATS to get 31% off!